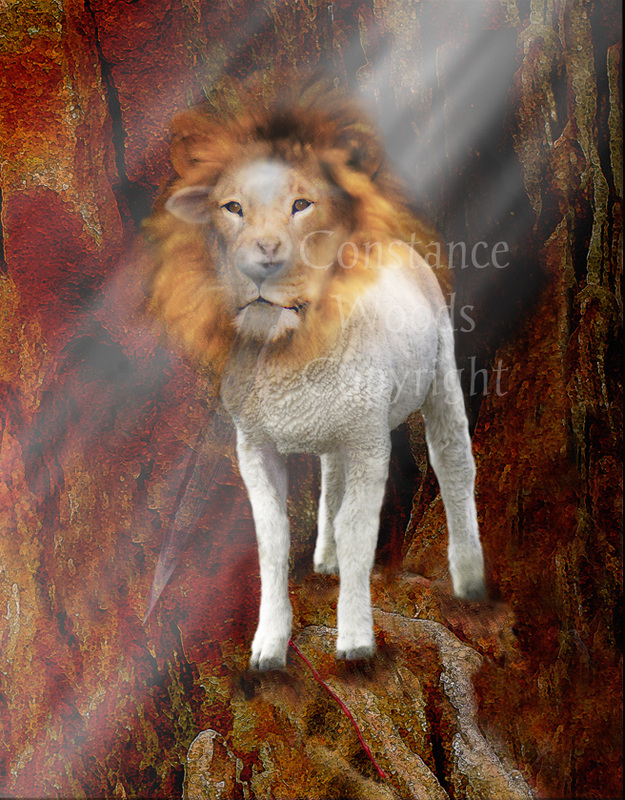 Revelation: Jesus is like a lion, yes, and Jesus is like a lamb. May this image be used by the Lord for His Kingdom purposes in this hour! He is releasing revelations to those who are seeking Him wholeheartedly, to those who have an ear to hear what the Spirit is saying. My desire to create a painting that combined the lion and the lamb characteristics of Jesus began with trying different positions of the two. I kept trying to work with profiles. It was very exciting when I layered the lamb's eyes over the lion's eyes. At that moment I added several layers of each animal. Then, led by Holy Spirit I began "taking away what wasn't supposed to be there" in each layer. Afterwards I realized the process was much like sculpting. Except that I was using digital tools. Artist Comment: When I was in Colorado in March of 2007 God gave a divine opportunity to photograph baby lambs. It was the day before Passover that the original photo was taken. Did you see the sword?